We offer this affordable willow coffin handwoven by a small weaving cooperative in Europe that currently supplies coffins to the UK. The white color is achieved by peeling and drying the willow - it is not painted. 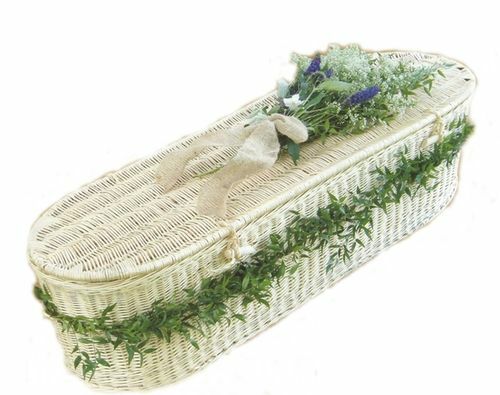 All our willow coffins are suitable for burial or cremation. Wooden runners can be fitted to the underside of the coffin to facilitate the cremation process upon request. Each coffin will carry over 350lbs in weight. We offer the white willow in Child's sizes - 4' and 2'.